Alice Springs is the undisputed focal point of the Indigenous arts industry. This industry has grown rapidly over the last thirty-five years creating a concentrated and energetic visual arts community. A high number of non-Indigenous artists have joined the many Indigenous artists who call Alice and the central Australian region home. The interaction between these two artist groups has been a constant industry influence. Exchange and creative influence is ongoing and based on skills sharing and cultural respect. WTS was seeded as a response to the lack of contemporary arts activity in Alice Springs/Mparntwe in 1991 by five artists: Pam Lofts, Anne Mosey, Jan Mackay, Angela Gee and Pip McManus. WTS was first established as an Artist Run Initiative in 1993. The first charter of WTS stated that it was essential that it be artist run so it could maintain its independence from commercial galleries. Providing a forum for artists wanting critical dialogue on works in progress and resolved works. It was for a venue for emerging and professional artists as it was a non-commercial Space with no pressure to sell. It was to be an exchange between artists around Australia and internationally with 50% local and 50% visiting artists. There was a strong emphasis on collaborations between artists and all media. annual program be cut down to five exhibitions a year, there was community outrage as this is one of the main places for local artists to exhibit their work. Over the years WTS has secured funding from Arts NT and the Australia Council for operational costs and also for different projects such as artist camps, web galleries and offsite installations and exhibitions. All of these projects focussed on exchange, audience development and alternative Spaces to develop and exhibit work. Testament to the needs of Alice Springs artists and also to the power of the arts on a whole, WTS still exists and has a large following in Alice. In 2007 WTS developed the contemporary site-specific program Shifting Ground. Attendance across Shifting Ground was over 4,000 and new audiences were reached as it took place in public spaces frequented by community members on a daily basis. Shifting Ground has been recognised nationally, on the strength of its artistic merit and has received media coverage in the Australian (May 8 2007), Real Time magazine (Aug- Sept 2007) and The Age (March 1 2008). Shifting Ground was a highlight year for WTS with its significant off site program of events, installations and exhibitions. Shifting Ground was successful in exciting, informing and challenging the local community. This was particularly evident with the occupation of the empty shop spaces in Reg Harris Lane. Featuring performance, video and visual work; these were stimulating and highly original events that not only attracted regular art attendees; but attracted tourists and the average person doing daily chores. Since the success of this event, a shop front in Reg Harris Lane has been leased as a commercial artist co-operative. In 2008 engagement with the wider community through off site projects continued with the WTS / RedHOT Arts shop front project Alice in View. 22 business premises hosted works by 28 artists from the Alice Desert Festival in August through until the Masters Games in October. In 2009 WTS presented a Little Cube of Eco Art – a portable miniatures gallery as part of the Alice Desert Festival Hub Space, 30 artists exhibited over 100 artworks on ANZAC oval. 2/5 of the Founding Members: (L) Angela Gee & (R) Pip McManus, (M) Mary-Lou Nugent, with founding member Jan Mackay's hanging fabric artwork in the background. Circa 1995. Watch This Space has conducted Strategic Planning to plot the trajectory of future artistic exertion for our organisation. We explored our history and possible futures across two sessions with our Boards, members, interested parties and organisations – “Session #1: Deep Space Exploration” and “Session #2: Mission Control” facilitated by Penny Drysdale. ● Stimulate open dialogue around perspectives in arts and culture, its particular relevance in the constellation of Alice Springs, and how they shape and impact art/collectives/orgs and vice versa. 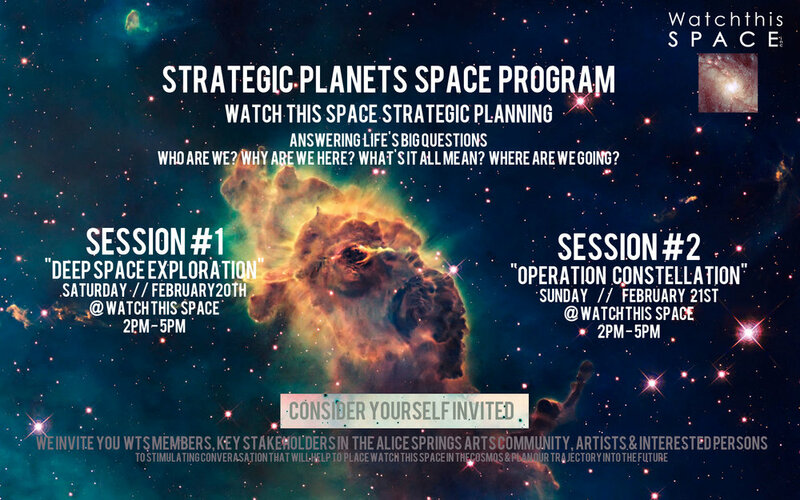 ● Generate dialogue and stimulate ideas as we orbit around the planet of Watch This Space in the solar system of Arts and Culture of Alice Springs, in the Galaxy of Art & Creativity. ● Gather ideas towards a reshape our vision for Watch This Space that will help the organisation design a realistic and sustainable model to take us into the future. PRESENTERS: Dan Murphy (WTS Chair/Banana Lounger, Artist) // Penny Drysdale (Moderator, sometime spoken-word poet) // Pip McManus (WTS Founding Member, Artist) // Kieran Finnane (Arts writer and critic, Alice Springs News Online) // Kieren Sanderson (ASTC Arts & Cultural Policy Officer, Creative Producer) // Alex Kelly (Artist, Filmmaker, Producer) // Jimmy Cocking (ALEC Director, environmental advocate, festival producer) // Alexandra Hullah (WTS Coord, Artist, Creative Director) WTS SUPPORT Beth Sometimes // Frankie Snowdon GUESTS WTS Board. Read more. An independent exhibition by Mervyn Rubuntja and Family. A public artwork in collaboration with Watch This Space resident Artists, Province (Al Dadak and Laura Pike), Hidden Valley Artists (Tangentyere Artists), Watch This Space with support from Red Cross Australia, 8CCC Community Radio, Lhere Athepe, IGA Eastside & Eastside Shops. Anna Flouris (cultural Custodian), Miriam Pickard and Sia Cox perform in Craig San Roque’s Persephone’s Dog at the Old Ilparpa Quarry, Alice Springs. A special performance by Craig San Roque and friends. A performance by Lofty Award Winner, Franca Barraclough at the 2014 Lofty Award Night. The performance centres around a ritual that brings together improvised collective choreography around a ritual that ceremoniously ‘cleanses’ all the art our of the gallery to make way for the new art of the approaching year. Kieran Finnane sits in the Todd River with Heavitree Gap in the background, Alice Springs, 2014. A special presentation Series by artist critic and writer, Kieran Finnane. in partnership with WTS, Elephant Island & Creative Partnerships Australia. “It’s hot in the desert of Central Australia and the only thing breeding faster up here than flies and germs, is talent. We moved to Alice Springs three years ago and it has never ceased to amaze us how this tiny little town manages to maintain such a dangerous ratio of gifted artists, musicians and creative folk. People in The Centre might not show up on time, or with shoes, but when they eventually arrive, they do so with a DIY, get-involved, whole hearted approach that is truly unique and deserves to be celebrated. FREE BBQ CASH GIVEAWAY will be that celebrating champion. The three week festival is being hosted and developed by us – Josh Davis + Alex Hullah (we are the creative team Elephant Island – and the Alice Springs ARI (Artist Run Initiative), Watch This Space. Together this super group looks to re-activate Watch This Space into an open studio collaboration between local and interstate artists all working together to produce and exhibit new work and get the community involved. A key area of focus for this collaboration will be the creation of a Sculpture Stage inside the gallery, which will happen within the first week of the festival. The Sculpture Stage will be an experimental product of art-making and interactions and the final creation will then be used to host seven days of curated events, performances, and temporary exhibitions." Find out more about FBCG here. (Founding members, Jan Mackay, Angela Gee & Pip McManus). From Pip McManus’s slide presentation on the history of Watch This Space, 2014. As part of our 21 year celebrations. WTS received a grant from The Community Benefit Fund to assist in creating a digital archive the first 7 years photographic slides from exhibitions at WTS. Founding member, Pip McManus gave a special presentation with a selection of these slides. A preview from the Arc of Waking, An immersive theatre experience at the Old Alice Springs Women’s Gaol by Afsenah Torabi, WTS artist in residence, 2015. Watch This Space has been providing residencies for visiting artists since 2013. Artists are invited on application to participate in our onsite community for one-month periods to develop new work. Many artists respond to the unique geographical and cultural landscape and WTS has assisted in helping build engagement opportunities with the wider Alice Springs community. 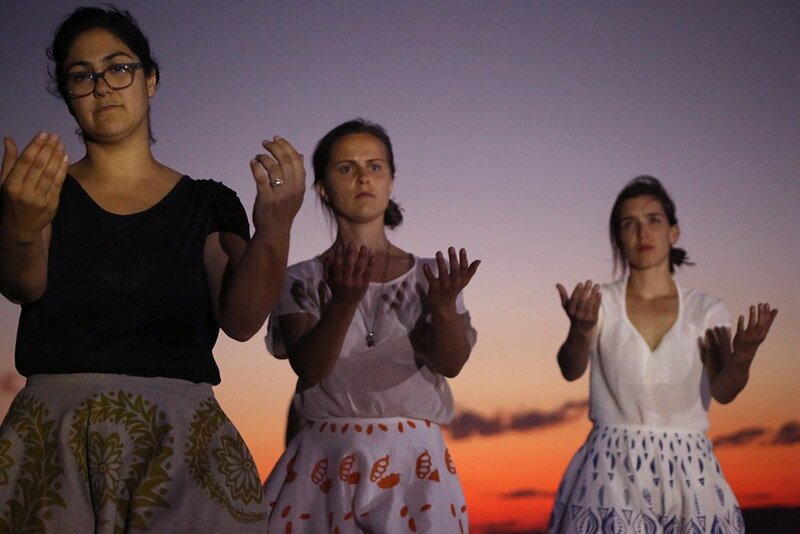 Feature: Resident Artist, Afsenah Torabi on her residency at WTS and her immersive theatre performance, The Arc of Waking. The Long Weekend in Alice Springs, front cover. In the riverbed at The Artist Wants A Life Camp, Honeymoon Gap, 2012, Alice Springs. ARTIST WANTS A LIFE was a camp and arts lab run by and for artists. It was open to practicing contemporary artists of any form or discipline and took place in Central Australia in April 2012. Beth Sometimes and collaborators were interested in devising a developmental experience for artists around the theme of communication and cultural heat. The program was designed by the provocateurs as a flexible space for experimentation. Participating artists: Claire Wieland, Mel Henderson, Sia Cox, Patricia Hay, Kelly Lee, Jesse Cox, Lizzy Sampson, Jodie Ahrens, Skye Loneragan, Tessa Zettel. Provocateurs: Lynda Roberts, Bek Conroy, and mentoree provocateur: Beth Sometimes. Watch This Space project team: Robyn Frances Higgins, Alice Buscombe and Dan Murphy. Documentation: Sweatshop Creative, Alexandra Hullah, Josh Davis, Damon Logan. AWAL was funded by Arts NT and the Australia Council for the Arts. Thanks to: Doris Stuart (Sacred Sites Tour), MK Turner and the Turner family, Keith and Stella Castle from Honeymoon Gap. Souvenir exhibition, Watch This Space, 2011. Is Central Australia just one giant souvenir? Are we all just unsuspecting characters in a surprisingly life-like theme park? Over the decades the outback has been presented as the last frontier, a place of high adventure with carefully measured risk. How have the depictions conveyed via mass manufacturing of souvenirs for the tourist market shaped the identity of the Centre since colonisation? Do these images reveal more of the psychology of White Australia than of the place itself? Are souvenirs just dated artefacts of a traveller’s journey or the glossing of more complex truths? What are we not remembering? Co-curated by Red Hot arts’ Franca Barraclough and Beth Sometimes from Watch This Space, Souvenir will be a Central Australian group show showcasing the work of over twenty local artists and one international artist. A Watch This Space exhibition at Araluen arts Centre. ‘Cultural people’, artist and story-tellers from Alice Springs Desert Festival and Free BBQ Cash Giveaway Festival on the sacred sites tour with Doris Stuart, 2014.